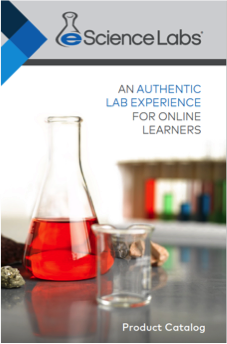 eScience Labs collaborates with hundreds of higher education institutions to provide a traditional hands-on laboratory experience to students engaged in online and blended learning. REAL-WORLD EXPERIMENTS Developed by PhDs with student safety in mind. RIGOROUS DIGITAL CURRICULUM Virtual learning opportunities and easy LMS integration. CUSTOMIZED LAB KITS Tailor a lab kit to your specific course curriculum. DEPENDABLE, EXPERT SUPPORT Dedicated partners to support faculty and student success. "The students really like the kits and the labs. They say it’s the best part of the course." "If you want your students to experience science on their own, improve their abilities as independent learners, or just reach students at a distance, these kits are worth a look."